What’s for breakfast? Who’s picking Johnny up after school? Which route to work has the least construction this morning? Skim milk or soy in that latte? Where to go on vacation. Most of us make multiple decisions every day, fueled by an internet full of expectations and options. But business owners? Between the business, your employees, your spouse, plus your immediate and extended family members, it can seem as if people are asking you to make decisions non-stop all day. Some are big, and many are small, but it is well documented that making decisions over and over again drains you and leads to decision fatigue and worse decisions as the day goes on. By the end of the day, no wonder doing nothing about how to save, invest, or protect your money feels like the best choice. For an entertaining and enlightening look at the effects of not making rational decisions, or procrastination, check out Tim Urban on TED [VIDEO] and his Forbes interview . My key takeaway from Tim’s TED talk is the distinction between deadline situations when the ‘Panic Monster’ wakes up and rescues you, and the non-deadline situations where opportunities are lost and decisions are made by default. “Well, it turns out that there's two kinds of procrastination. Everything I've talked about today, the examples I've given, they all have deadlines. And when there's deadlines, the effects of procrastination are contained to the short term because the Panic Monster gets involved. After the unexpected death of a key investor, you discover their business partner’s heir is a 17-year-old with a full-blown substance abuse problem. You have decided you want out of this traditional business in order to start a new social impact, purpose-driven business, and your buyout agreement does not stipulate the price or how it will be determined by the owners. Now, as the selling owner you are pushing for a high value while the remaining buying owners want a low value. 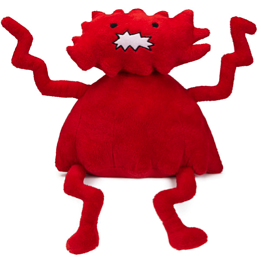 I can think of at least one business owner I know who keeps a red stuffed ‘Panic Monster’ behind her desk to chase away procrastination and delayed decision-making. What about you? Is it time for you to act on important decisions that you need to make? Heidi Clute, CFP® is co-owner of Clute Wealth Management in Plattsburgh, NY, and South Burlington, VT, an independent firm that provides strategic financial and investment planning for individuals and small businesses in the Champlain Valley region of New York and Vermont. For a list of states in which we are registered to do business, please visit www.clutewealthmanagement.com. 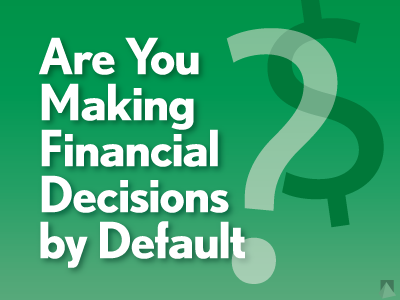 #1-629741 Are You Making Financial Decisions by Default 8/2017.